Sue Grills has something of an affinity with Monday’s Memorials race meeting at Gunnedah. The Tamworth trainer has three runners plus an emergency for the seven-race TAB meeting which includes an Arthur Gore Memorial, Keith Swan Memorial and the Bective Station Somerton Cup. Sue, a Hunter and North West Racing Association trainers premiership winner, started her career at Somerton as a young apprentice riding for her “pop”, the late Arthur Gore, and her uncle, the late Keith Swan. “Yogi (her twin brother Ron McGrath) was actually apprenticed to Pop,” she said. 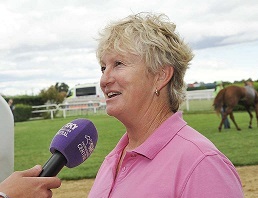 Sue Grills will be keen to claim a winner at Gunnedah on Monday. (Pic: Bradley Photos). She remembers it well, although the date is a little hazy. Might have been 1987. Keith Swan then took over from Arthur and won a Tamworth Cup with Drop A Note as well. While Sue’s riding career lasted just three or four years her training career didn’t start for another decade. “Only got my licence when Uncle Keith was sent out,” she said of a rare suspension for her late great uncle. Then with his passing her training really ramped up at Somerton before she made the big step of moving into Tamworth. “That was 10 years ago,” she said. It has had its positives and negatives. Training at Somerton was easier, quieter and she could do what she wanted, such as working the horses the reverse way of going if she wanted. However in Tamworth (at the track) she has the chance to gallop her horses on the grass track and days like Wednesday’s 10 barrier trials. The biggest problem at Somerton was “getting and keeping staff” she said. That also holds true in Tamworth as well. Along the way she has had some great highs and some lows. Outstanding galloper Border Rebel was a magical little horse who won three Listed races (Takeover Target Stakes at Gosford and two Hinkler Handicaps at Eagle Farm) in amongst many others. The lows were the deaths of young jockey Tim Bell, who started his career as an apprentice with Sue and more recently Darren Jones at Warialda. Darren rode a lot of work for her and helped out greatly. So to Gunnedah on Monday Sue will have many memories of her “Pop” and uncle as she saddles up Moonlight Spy in the Arthur Gore Memorial (1400m) or Bective Station Somerton Cup. She also has Whisper Delovely in a 1000m maiden and Hammoon Dancer and emergency Hallucinate in the Keith Swan Memorial (1300m).